Download complete and HAVE PARENTS SIGN the DS-64 form. Note: There is no real position the government takes on what kind of information they expect to have reported on this form, aside from answering the questions clearly. Often people say “well if I knew where my passport was, it wouldn’t be lost”. It’s a good point. However, what they are trying to determine here is if there has been any inappropriate activity such as fraud or other criminal behavior or just negligence on the part of the passport holder or parent. So it is best to just explain as much information as you possible can to help them to determine if you might be able to find it, or - if it is lost - is it in the hands of the wrong person. If the Child is under the age of 16 the Child must have BOTH parents apply with them. 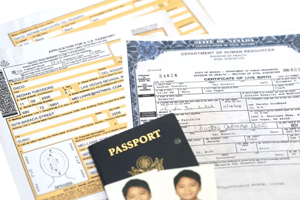 If Child is under the age of 16 and BOTH parents cannot be present then a State Department Form DS-3053 must accompany the application process. The DS-3053 must be filled out carefully and it also must be notarized. You must also submit a clear and legible copy of the front and back sides of the Driver’s License (or other form of acceptable I.D.) of the parent giving permission on the DS-3053. If either Parent is deceased the other parent must submit an original Death Certificate with the passport application. This is the fee the State Department charges you when they issue your passport. You are issuing your passport quickly so their fee is higher than normal. The Standard fee for an adult expedited passport is $165.00. This fee includes a witnessing fee of $25 to be given directly to the witnessing agent. Our service fee is additional to the government fee.